Fancy Dancer: Red or Blue? 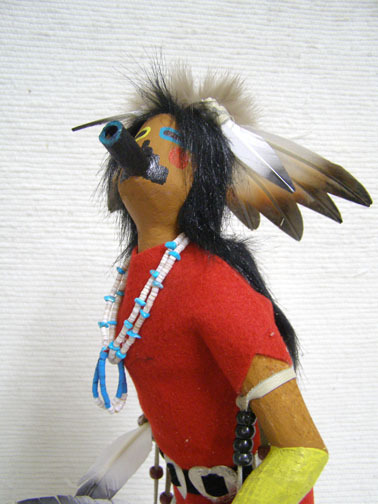 Sammie Walker, master carver of Kachina dolls since the age of 8, was born to Deer Water Clan. He spent his childhood in Sand Springs, Arizona, in the heart of Tony Hillerman Country, where he helped his family with their farming and the tending of their 360 sheep, 67 cows, and 37 horses. Sammie's father was a medicine man who also fashioned moccasins form the cured hide of their cattle. At the age of 8, Sammie developed a love of carving after working on a 2x4 that had been saved to repair the family's horse drawn wagon. Sammie's first doll was a simple stick-typo figure with no base. Pine tree sap was used as glue and the arms were secured with horse shoe nails. He and his father took the doll to Bruce Powell, owner of a trading post at Old Oraibi. He bought Sammie's doll for $35.00. That was the beginning. Realizing that his son had a gift for carving Sammie's father introduced him to a Hopi friend, Many Cattles who gave Sammie a book on Hopi Kachinas and then taught him the art of carving. 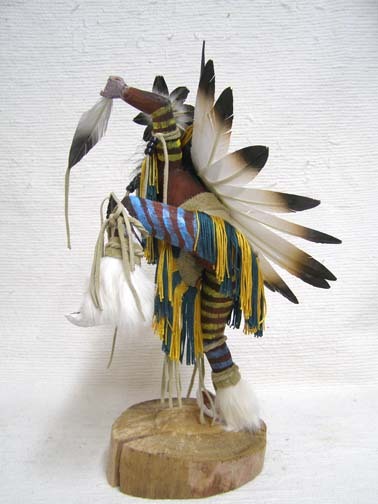 Later, Many Cattles initiated Sammy in one of his Hopi plaza dances. Since that time Sammie has carved dolls for local enthusiasts as well as for Presidents Ronald Reagan and Bill Clinton and President Fox of Mexico. Blue A'hote is considered a good hunter. He may appear in any of the directional colors, the two most common being the Yellow (Sikyahote) or the Blue (Sakwahote). The A'hote is the Grand Katsina Uncle of the Mixed Katsina Group and appears in the Mixed Dances. The A'hote is painted in two different ways. He appears with planets on his mask. 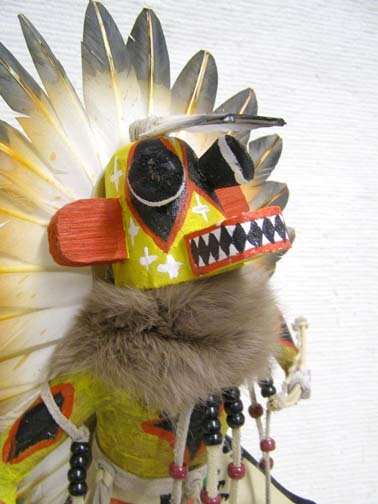 The other A'hote version has a "split" mask with different colors on each side. 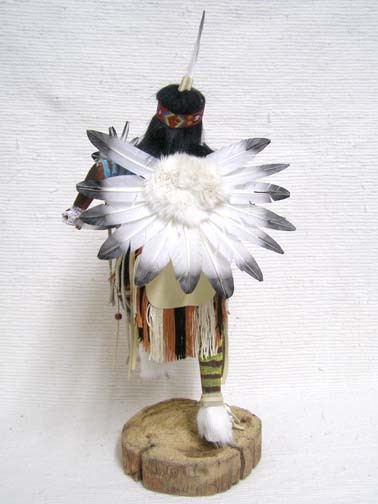 Both seem to be derived from a Plains Indian because he wears a long trailing eagle feather headdress. 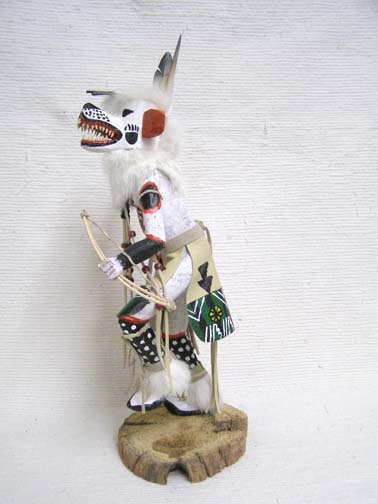 The action is wonderful and the carving, painting and details are very accurate 18"
Yellow A'hote is considered a good hunter. He may appear in any of the directional colors, the two most common being the Yellow (Sikyahote) or the Blue (Sakwahote). The A'hote is the Grand Katsina Uncle of the Mixed Katsina Group and appears in the Mixed Dances. The A'hote is painted in two different ways. He appears with planets on his mask. The other A'hote version has a "split" mask with different colors on each side. 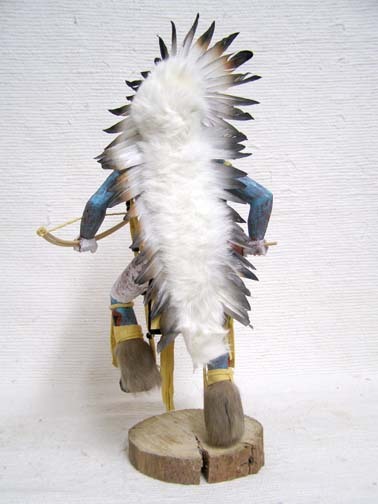 Both seem to be derived from a Plains Indian because he wears a long trailing eagle feather headdress. 20"
This great and powerful leader possesses spiritual strength used to protect and cure the sick. The Bear (Hon) Katsina is considered to be the number two healer for the people. His knowledge of herbs and roots gives him the power to heal the sick. The Bear symbolizes power, strength, courage, wisdom and healing. This is a wonderful piece that is created in a style that is unusual today. 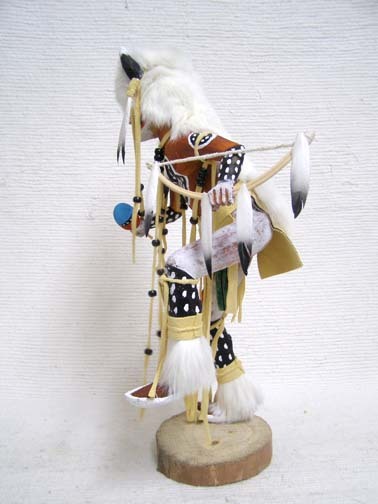 Very few of the artists make the Native American dolls this way. The action is wonderful and the carving, painting and details, especially his teeth, are fabulous. 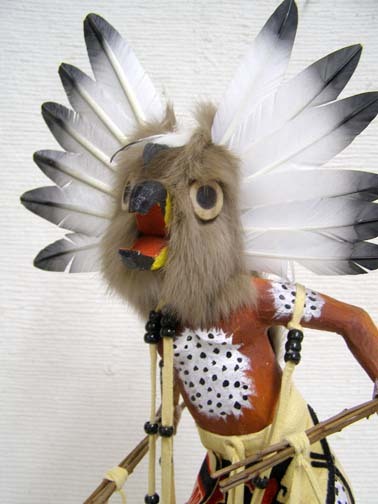 20"
The Brown Owl (Mongwu) is the leader of the warrior Katsinam and brings the whippers to the summer dances. He is called upon to discipline the clowns for their non-Hopi behavior. The Owl appears at more than one ceremony, and in different ones at different Mesas. He appears in the Mixed Katsina Dance and in some ordinary dances. At First Mesa, he takes part in the Bean Dance (Powamuya) and in the Water Serpent Ceremony. He is considered a sorcerer. 20.5"
Like most animal Katsinam, the Buffalo (Mosairu) dances to increase his kind. This Katsina is very well-known and is the most powerful. He can kill any evil thoughts and is a great spiritual protector. This is a wonderful piece that is created in a style that is unusual today. 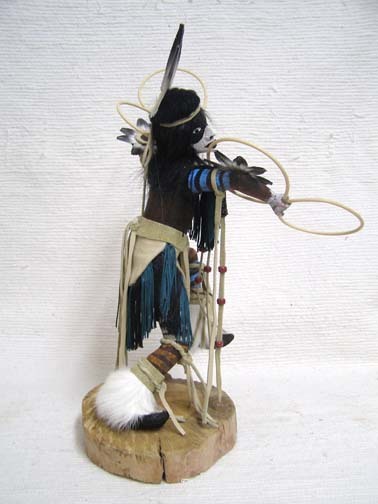 17"
The Blue Fancy Dancer is much like the Hoop Dancer. His purpose is to entertain the audience. The feather fan dance bustle is meant for passing along prayers. 16"
The Red Fancy Dancer is much like the Hoop Dancer. His purpose is to entertain the audience. The feather fan dance bustle is meant for passing along prayers. 20"
The Feather Dance is performed by a young girl. She dances to the four directions. To the East she dances for the Sunlight; to the North she dances to the magic blanket of snow and the Northern Lights; to the West, she dances for the wind that is the breath of life; and to the South she dances for the nourishment that comes from the young plants. Then, finally, she dances to the Center, this is the dance for the Sacred Fire the warmth and the sun. 18.5"
BLUE HOOP: The primary function of the Ceremonial Hoop Dancer is to amuse the audience during a major ceremony. The circular rings represent the circle of life. The Hoop Dancer is about amusement, joy, happiness and connecting us to our nature for humor. 16.75"
RED HOOP: The primary function of the Ceremonial Hoop Dancer is to amuse the audience during a major ceremony. The circular rings represent the circle of life. The Hoop Dancer is about amusement, joy, happiness and connecting us to our nature for humor. 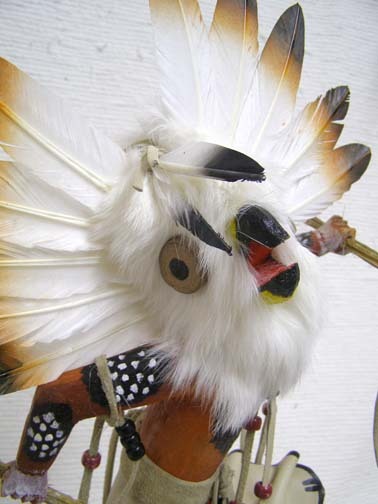 17"
The White Owl (Mongwu) is the leader of the warrior Katsinam and brings the whippers to the summer dances. He is called upon to discipline the clowns for their non-Hopi behavior. The Owl appears at more than one ceremony, and in different ones at different Mesas. He appears in the Mixed Katsina Dance and in some ordinary dances. At First Mesa, he takes part in the Bean Dance (Powamuya) and in the Water Serpent Ceremony. He is considered a sorcerer. 19"